Happy February! I finally beat you all! I'm first! Right? I learned a new word that completely describes what I felt, after my CT test, the other day. It's called the ataraxia effect. I'm not going to explain it. You have to look it up, but it's perfect, and so funny that it came in my dictionary word of the day, e mail! I think, I hope... I might feel it again, once the show is over. Maybe after my annual breast cancer mammo, too! But, I like it! I like it! I still feel it! Show details are now on hold, with the untimely, unfortunate, heartbreaking passing of Carmen Macdonald. Not that it's the biggest problem in the world, by far... but I have no idea what's going on. I'm working with his business partner, Kris, to sort things out. But, Carmen did the kwikfish on his own, and didn't share this project with her. We don't know where the kwikfish are, and we don't know if I'll get them by show time. I don't know if I even have a booth to be in. I just don't know anything! If nothing else, I will just pay the postage to send you your kwikfish. I will have to get everyone's address to send them out. If I can't figure that out, I will either hold a sale at one of the sports stores in town, or I will simply refund money if you don't want it sent to you. So... that's what I know, today. I may know more, tomorrow, or later today? I may be doing the show! I just don't know! If you need help logging in, contact me! The show must go on! I think I'll be there with the kwikfish, albeit in pieces, but I'll be there. (I won't be in pieces, I hope... but the kwiks might be! I' a mess. I'm so behind. Please excuse me! What happened to the days when I could lol around and write and fish? Oh. I know. I sold ifish! HUH? I'm so terribly sorry for those that drove hours to get your kwikfish. When I wrote the column below, and even in the car, as I drove to the show... I talked to the people in charge. They maintained that the kwikfish were at the show. That's why I drove there! Anyhow... I got there, and there were no kwikfish. Look, guys... it's no ones fault. Everyone is doing ALL they can do get this together. Unfortunately, many people don't know Carmen, nor how the kwikfish come to be at ifish.net. Carmen has always faithfully delivered the kwikfish on time for the show, but this year, tragedy struck. Carmen is no longer with us, and no one seems to know where 500 of the kwikfish are. I was told that the kwikfish were at the show. I thought all of them were there, when I drove there, but on the way, I got a phone call that someone at Rapala said there looked to be only 200 or so. I kept driving, thinking, "OK... so I'll sell 200!" But, then when I got there, they were no where to be found. Roger, thinking he was doing a favor, which he was... took them to assemble them. I didn't know he would take the only ones we had to assemble. And, he can't get them done until after the show, of course. So, I will be using those to mail to the pre order guys. I'm just sick about this. I have received angry e mails and private messages from people who don't realize and are not close to the situation... They don't understand how the kwikfish process has always worked, nor do they know that Carmen has passed. This is the MOST difficult thing to write about, because I don't want to hurt ANY feelings. Everyone involved has gone over and above to help out But, they are also busy getting details about Carmen's service arranged, and everything that has to be done that to the family and Carmen's close friends, is far more important than a fishing lure. All I can do is to pray that you understand. I am frustrated, also. But, there is no where to vent that frustration, and I feel guilty for even having frustration. It's just not the time. All I can say is that I am terribly sorry for your frustration in this very unfortunate situation. I've gotten into this horrible habit of waking at around 12-1 in the morning, and watching television, because I can't sleep. When Bill used to have that problem, I'd say, "Just sleep! It's easy!" Now, I get it. It's me who can't sleep! Oh, that's a really bad attitude, Jennie! That's what I think! I have to stop that negtive thinking, darnit. I used to be the one thinking positive! This is the first year I haven't been to the Sportsman Show for a long, long time. I have got this awful waiting feeling, not knowing exactly what lies in the future. That bugs me more than anything. The not knowing... Not having a laid out plan. We need to know where the kwikfish are, before I can make any plans. Well, that's not true. I think if we haven't found them in a week, I'm going to proceed as if they are just gone. But, how in the world can those kwikfish just be gone? No one would want "IFISH" kwikfish?? They are already painted with our name on it. Or maybe they aren't!? I don't know the process. Sometimes it's just a sticker that goes on the lure that says Ifish. Sometimes it's painted. I'll have to ask Bill (Bill #3...) about that. How many "Bill"s can one have in their lives? This Bill is at BC Angling. See you at Carmen Macdonald's Service on Monday? I'm finally back to the coast to heal from a most harrowing month. After what I've been through in my life, it's hard to say that. You know, aortic dissections, and near death experiences, but this month was harrowing. I have to go look that up, to see if it's the best word. BRB. OK! "acutely distressing" I'd say that's accurate! I have a lot to say, today, so bare with me. Funny. I've always wondered whether it's "Bare with me" or "Bear with me." and I guess others have wondered the same. I googled it, as I do many things, and the entire page was made up of this question. Of course it would be "bare with me" because otherwise, you'd be doing it with a bear! WRONG! Read here, to find out why! So, with me! That's just weird. 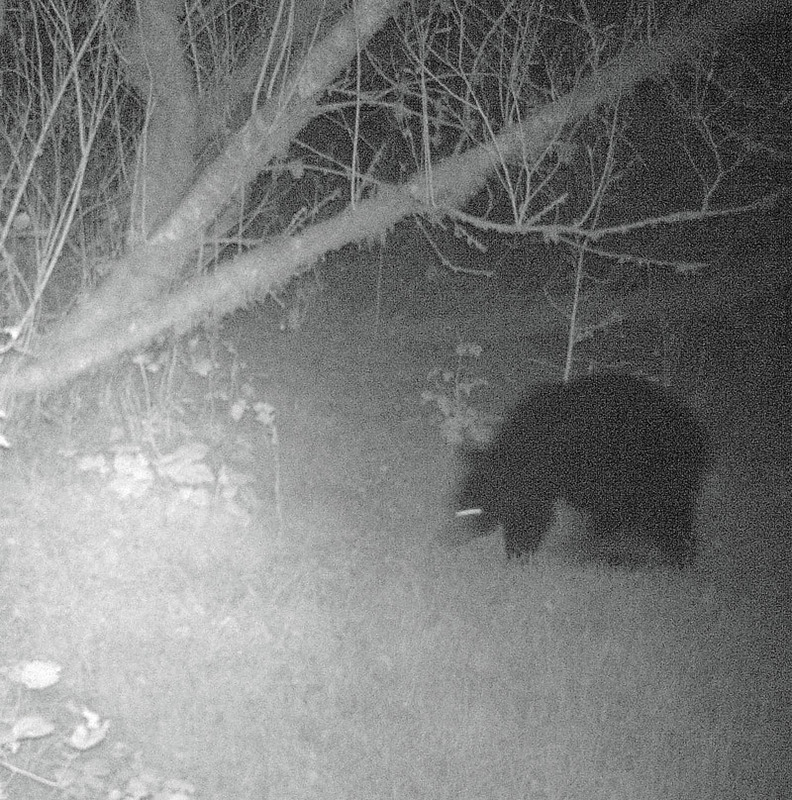 Speaking of bears, look what was on our cam! That was a while back, but not sure if I posted it. I had "bear" on my mind. So, back to this harrowing month. Geemany. I don't know where to begin. Time flies...heck it's already October. What are your thoughts on the Kwikfish contest this year? Please let me know. I'm already behind the curve on timing. Breaks my heart to read through our notes. When I do a search of my gmail, it says "1-150 of many". :( We were mostly e mail friends, but you know how that goes, these days. Many of my closest relationships are e mail only! OK, so I was busy with all that, and so was he. We went through the contest, the finalists, and the mockups of the finalists! Something new, this year! Oh, tears... here they come. Carmen started that new! He was just so great to work with! So, then the winner won, and we ordered, and everything was set! So, I prepped for the show... even bought a new outfit! :) I found out a week before the show, that Carmen couldn't help, so I panicked, and tried to get volunteers, here. You know, I still think that is so weird. I e mailed Carmen, since I hadn't heard from him, a week before the show. I just wanted to make sure it was like always. That he would be getting my ticket, and that we'd be in the booth together, laughing as always. I emailed to make certain he'd be able to handle the cash at night, etc. But.. I didn't hear back. I e mailed again. No answer. One more time... I finally called him and that's when I heard that the staff would be too busy this year. I understood. I had kind of taken it for granted that it would be the same, and I felt he was having trouble telling me that. So, I got busy and got volunteers. That's always difficult. When I had my own booth, I'd spend weeks setting up the volunteer schedule. It became more difficult, with each passing year. This year we don't have many mods, and they are all from all over, so that was out of the question. I was relying on members of ifish that I had never met before. This was exciting, but a bit scary, not knowing who I was having there! LOL. I was looking so forward to meeting them, though! How nice of people to just volunteer! Ifishers are SO awesome! And then that horrific morning, February 5th, when I looked to see a private message by the name of "horrible news". I thought at the time, "Oh. someone lost their password or something..." But, then I had to write to Carmen, first, telling him the final show schedule that I made with volunteers, how many tickets I'd need, etc." I wrote the letter, and then went to read my private messages. "Horrible news" was that Carmen was no longer with us. I sat in shock for a long time, there at my desk before I went to wake my son up, shaking... I told him about it. He had met Carmen. One year, Carmen had done the entire show for me, during I think it was my eye mishap. He even delivered everything to my home, including the cash from sales. Every last bit of it. I tried to pay he and his staff, and he would not allow anything but a small amount. I really tried hard, too. So, from there on, my e mail and private messages were a mess of "the show is a go!" The show is NOT a go!" Rinse, repeat, several times. I mean, just look at my column or my discussion board entries from this month! I'd go from not knowing if I was even going to the show, to going, to not going to going without kwikfish... It was so messed up! Kris Nelson, Carmen's business partner was so helpful! She went to find the kwikfish at Carmen's house, and delivered them to the show. It was a go! That was the last word! Actually, the last word was that Kris said someone, maybe Roger? Said it looked like she had only found about 200 of the lures, so many might be missing. I thought that we could at least sell those 200 at the show. I couldn't imagine how they'd be just missing?? So, I went to the show. It was heavy traffic and raining so hard! A dreary, awful day with the loss of Carmen heavy on my mind. How was this going to go? It would be a tear festival. I bought tickets, bought volunteer tickets and parking tickets, and... and... I got to the show, and couldn't find the kwikfish Kris said she had delivered! I looked everywhere! Finally Sean Klaus came in the Rapala booth and told me that Roger Neufeldt had taken the lures to have them put together. I went from being in shock to being in more shock. or something. I couldn't really call it shock. What is sadness, shock, and stress called, all together, now? Everything could NOT have been more messed up! Losing Carmen was everything, and the kwikfish mess was bad, and it increased the stress and loss of losing Carmen for so many people. I felt guilty for being upset about the kwikfish, when losing Carmen was the big deal. At the same time, I had taken money for something that I couldn't deliver to people, of which many didn't even know Carmen nor how that related to something they had purchased! My head was spinning for a week of not knowing, well, not knowing anything! Where were the kwikfish? How many did we have? Was I going to be able to deliver some? All? Kris maintained that they were missing. Someone at the show in the Rapala/LJ booth told a bunch of ifish members that they had been found, and that I was just "over reacting." Who would say that?? Why? Sean? Did they have news I didn't know, or were they just trying to put people at ease, or what? Gads, I would do anything to be able to say I was just over reacting! Oh, please let me be over reacting! LOL. For an entire two weeks, I couldn't sleep. Now, I'm at least sleeping some. However, last night, very, very little. It was a start of "The show is a go! The show is not a go" Back and forth until we got to "The kwikfish are found! The kwikfish are NOT found! We have all the kwikfish! We have none!" Back and forth... every morning, something different! Roger finished counting the Kwikfish lures. There were 770 lure bodies plus the other components and packaging materials. He said it looks like most everything is there. He is shipping to Rapala. They will assemble and package and ship everything to you. Whew! Hope you are feeling better. That put a good dent in my depression, and raised my mood level a bunch. So, boys and girls, you will get your kwikfish as soon as I do! First, I'll ship out the ones that pre ordered. I didn't charge shipping, and I promised I'd pay for that, due to all of the delays. Some nice people drove all the way to the show from far away, in order to pick up their lures. Of course, I'm not going to charge shipping for you! But, some other extremely wonderful ifishers have sent me money to help with shipping, via paypal. Thank you SO much! You have no idea how much this helps the process! I was so surprised by this, wondering how they did that, but I guess they just used my paypal address from when they ordered kwikfish or decals, before! Ifishers are VERY good people! That's what I keep thinking when it all comes down to it. That's what I have been thinking for the 20 some years I have been running ifish. I can't believe how very awesome ifishers are! No matter what we go through, we come through! All of us! We are quite the group of fishers! Ifishers came to the rescue, when we needed volunteers. They have come to the rescue for so many things and for so many people over the years. I just love our group of fishers! Over, and over and over again. But, there is this lasting shadow over my entire being that won't ever get better, no matter how much we come to the rescue. This sadness and pain that just won't budge: The fact that Carmen is gone. Just gone! It is so difficult to deal with that fact, for me. I can't imagine that the smiling face of Carmen Macdonald won't be available at the show. His e mails won't ever show up in my mail box again. He won't talk on the phone with me, or come up with great ideas, like painting the mock ups of the finalists, ever, ever again. He won't patiently explain things I don't understand. Like, How do I deal with you being gone, Carmen? I know how to deal with it. It's just hard. I've been doing it with my son, Andrew. With each loss we experience, we become more and more familiar with the realization of it all. I do it with all my passed loved ones. I talk to Jim Erickson when I fish. I talk to my son, Andrew, when I'm searching for agates. I talk to my Dad and Mom quite often, when I'm doing anything that reminds me of them. When my home made pizza flopped last night, I laughed with my Mom about it. Having people close to me pass away makes my trust and belief in God, stronger, all the time. When I was young, it just seemed weird talking to "God". Sometimes it seemed to be just talking to air, somewhere up there. But, as I talk to those close to me that I have lost; my son, my Mom, My Dad... now I can see that God is real and we can talk to Him, too. I read in Carmen's obituary that he accepted Christ into his life, weeks prior to his death. Talking to my loved ones is the only way I know to deal with their loss and it helps me so much! OK...There has been much more to this harrowing month than this one depressing drama, but I've already gone way over my one column space, here! I'll just have to keep writing. I miss writing. I really do! I need to write. It's my outlet for stress management, amongst many other things. But, since I sold ifish, they have me doing other things, so writing has become something I have to do after my work, and often times my eyes are tired, by then. Thank you for listening! It helps!